The Tribunal began stamping conveyor accusations against the Serbs. Serving Western interests Serbian leadership, which came to power in October 2000, surrendered to the Tribunal absolutely all Serbian political and military leadership, protecting the country and people. No state in the world has not committed the kind! Of the 141 allegations of the Hague Tribunal 95 were filed against the Serbs, which is 70% of indictments (1). As this tribunal sentences Serb was sentenced to 1,000 years in prison. Of the Serbs, against whom the tribunal issued an arrest warrant had been killed or have died 14. Hague prosecutors pro-Western forces in Belgrade handed over almost all the secret documents of national security, military intelligence and the Supreme Defence Council of Serbia. And at the same time The Hague tribunal has not accepted to consideration of any crimes of NATO against the Serbian people, nor the majority of crimes committed against Serbs during the ethnic and religious wars in the post-Yugoslav local area. The question arises: who formulated the indictments and manage the activities of the ICTY, all these years? According to figures released by Florence Hartmann, a former adviser to the ICTY chief prosecutor Carla del Ponte, the Balkans, and her press secretary, from the very beginning the work of the Hague Tribunal prosecution was influenced by American and British intelligence services. In his book "Peace and punishment," Hartmann points out that in the second half of 1994, when "the tribunal finally started working," the prosecutor of ICTY arrived 22 functionary outfit all the necessary equipment to help her (2). Military analysts, lawyers, and in fact, agents of Intelligence agencies, all time worked in the Tribunal to carry out the tasks of government (3). Thus the Anglo-Saxons have a huge advantage in the Tribunal (4). Florence Hartmann quotes sayings Jamie Neck, spokesman of NATO, which is about the crimes committed against Serbs in Kosovo and Metohija, said: "Be assured that we (NATO) and the tribunal - a whole ..." and "... I am sure that Louise Arbour (Chief Prosecutor) will charge only the representatives of the Slavic nationalities, and anyone else "(5). Florence Hartmann points out that the prosecutor in the trial against Slobodan Milosevic, Geoffrey Nice, a long-term agent of British intelligence MI6 (7). She claims that Bill Stubner, Chief Adviser's chief prosecutor Richard Goldstone - U.S. military intelligence agent (8). Hartmann writes that the secret NATO operation, which led to the dismantling of many sebov accused the Hague Tribunal, was called "Amber Star" (9). Add to this the fact that the ICTY Prosecutor's Office employee known in Serbia, Natasha Kandic, Serbia's state security documentation for 90s of last century took place as U.S. intelligence (10). Completeness of the information given by Florence Hartmann, points out that the accusations against the Serbs did not write an independent prosecutors, but the American and British intelligence services, "completely loyal to their governments." This completely contradicts their activities even rules of the tribunal, not to mention the United Nations rules. The Hague Tribunal has carried out the task of punishment of Serbs and conceal the crimes committed over the Serbian people. 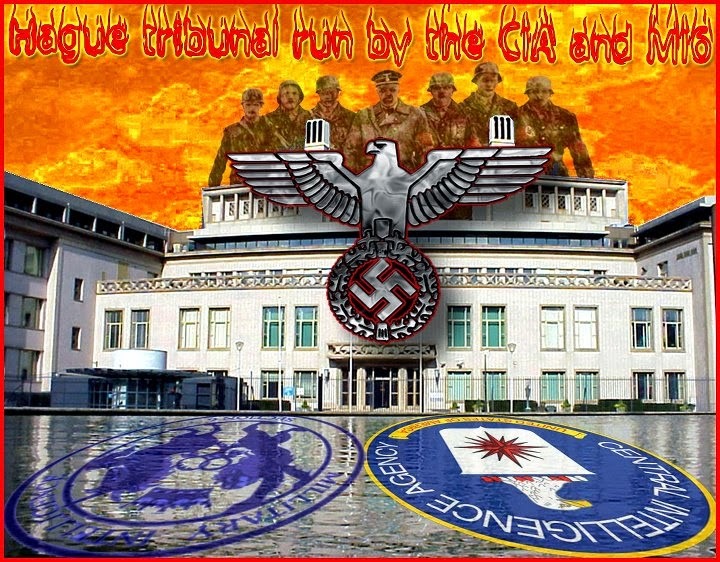 Formally, the Hague Tribunal was established by UN Security Council, created and funded by the Rothschild and the Rockefeller who are the Jesuits agents), so its employees are required to comply with the UN. The UN Charter clearly states that the staff and employees of the universal international organization can not vyponyat instructions of whatever the government (11). Almost identical to the wording of the Rules and includes UN staff, in which its employees undertake "not to seek or accept instructions from any government was" (12). Regulation of the UN staff in general rights and duties explained that the UN officials have no right to communicate with whatever it was government or its agents with respect to information that is not publicly known. If the UN official violates these rules, impose sanctions on him, and he can no longer work at the UN. However, despite these standards, the American and British agents to operate freely in the Hague Tribunal for many years, where do the job and serve the interests of their governments. Things have gone so far that the ICTY has refused to bring charges of contempt against Timothy McFadden, manager of a prison tribunal that handed the U.S. embassy representatives secret information about the health status of lawyers, private life of Slobodan Milosevic (13). The data presented Florence Hartmann, a responsible official of the ICTY Prosecutor's Office are sufficient grounds to commence an investigation of UN activities, and violations of the Hague Tribunal. If the U.S. and British governments abused the tribunal, then it is - no Court of Justice, but a tool that performs the will of Washington and London. And if an impartial investigation shows that the American and British agents influenced the work of the Hague Tribunal, this would be a sufficient legal basis for the revision of decisions ICTY. --- (1) Tanјug 20. јuli 2011. the hour, http://www.tanjug.rs/vest.asp?id=17450 (2) Peace and Treasury Taјni squares meђunarodne politics and truth, Florence Hartmann, "Philip Vishњiћ": Plus Club, 2007, p. 50 (3) Ibid, p. 54 and 55. (4) Ibid. (5) Ibid, p. 61. (6) Ibid, p. 89. (7) Ibid, p. 123. (8) Ibid, p. 150. (9) Ibid, p. 159. (10) See: Politsiјski dosiјe, Voјislav Shesheљ the document: DLXXXVIII. (11) Poveљa VH, Chlan 100. (12) Pravilnik for osobљe VH, Chlan 1. (13) See: take me with a Odluku pokretaњem istrage zbog neposhtovaњa Court, 18. јuli 2011. Godin, a subject of IT-02-54-Misc.6.